The major drawback to using shipping containers as habitable space is their thermal conductivity. Studies show that containers can reach an internal temperature of about 140° in direct tropical sunlight. To neutralize this effect in the Florida heat we are employing a number of strategies. Chief among them is to insulate our container so that in a thermal sense it performs like a giant Igloo ice chest. No element of the container will be left uninsulated. 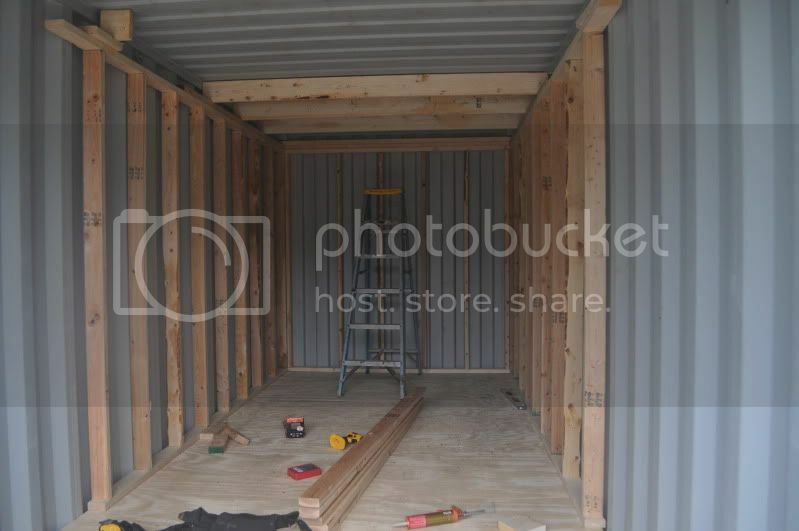 A modern shipping container has a thick floor made of a composite plastic/wood compound. 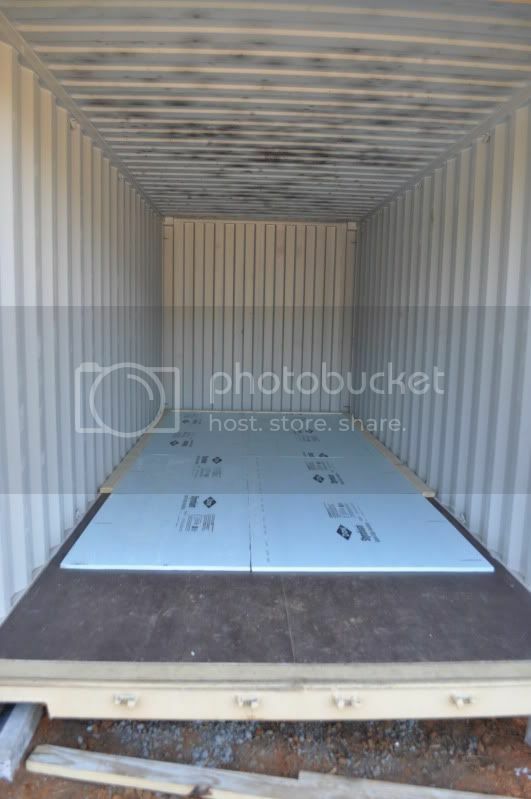 To our original container floor we added blue insulation foam board and then covered the foam board with tongue and groove plywood sheets. Eventually the plywood will be covered with bamboo laminate flooring. These layers should go far to insulate the floor of the container. Here you can see the blue insulating foam board being laid over the original composite floor. And here you can see the plywood being layered over the foam board. And here you can see the initial framing work. 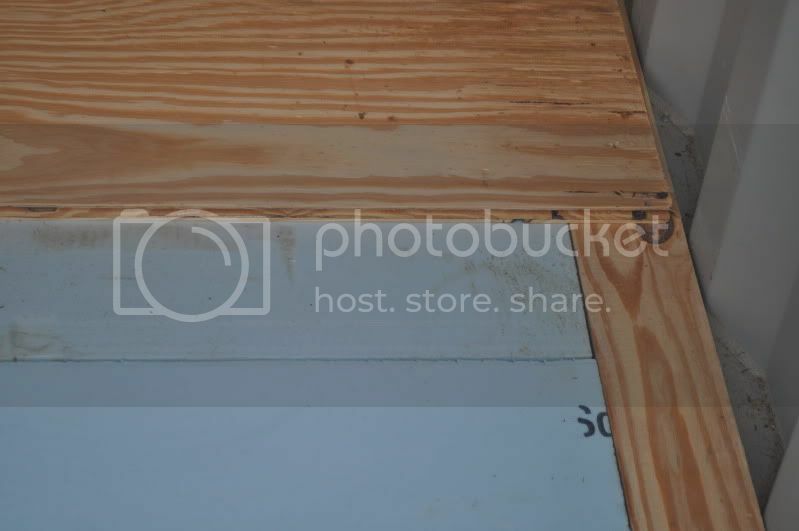 The wooden framing cannot be nailed to the walls and ceiling of the container. So, the studs are precisely cut for a press fit and then glued into place with Liquid Nails. We don't want to compromise the strength, insulating ability, or water repellent properties of the steel skin by creating hundreds of small nail holes in the 1/12" (2mm) thick sheet metal that enshrouds the container. Penetrations of the outer metal are limited to the minimum necessary. In this case, we hope to drill only one or two holes in the skin for the entire project.